5 medium size potatoes.. peel and cut the potatoes into two. In a karai add some oil and fry the onions until golden brown, then remove from the karai and keep them aside. Next fry the potatoes until crispy, the potatoes don’t have to fully cook at this point.. Once the potatoes are evenly crispy, remove them from the karai and keep them aside. 1 whole chicken cut into pieces. Marinate the chicken for about half an hour. Then shallow fry the chicken in the karai you used to fry the onions and potatoes. If there is no oil left, add some more oil (not deep fry). Cook both side of the chicken until the chicken is crispy and has formed a crispy coating around it.. 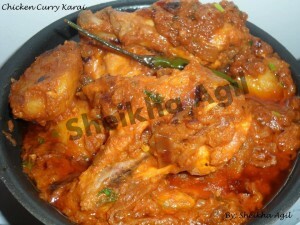 The chicken doesn’t have to be fully cooked at this point.. Then remove the chicken from the karai and keep aside. In a blender, add all the above ingredients and blend. Then keep aside. Use the same karai you used to fry the onions, potatoes and the chicken to cook the sauce.. Simply pour the blended tomato mixture to the karai (make sure it has some oil) and cook until the mixture begins to reduce. You can add whole green chilies if you want and continue stirring the mixture. Then add coriander and mix well. When the curry starts to thicken, add the fried onions, potatoes and the fried chicken and continue cooking until everything has cooked to perfection and the curry has reduced a lot.. Then remove the curry from the stove and serve it with chapati or rice. You can leave the curry saucy or let the curry dry out even more.